Two weeks ago, I had several days of a cold + allergies. I passed it onto the kids (sick all last week), and then Geoff finally caught it. Now, I’ve gotten it again! Ugh! Right now, it’s a sore throat and my head feels funny. Joy. I was feeling a little nostalgic re-reading Miles’ baby blog. Re-reading the weeks leading up to his birth, and the day he was born. I was feeling sad and sweet. But I really don’t want more kids. I’m just sad my baby is turning two on Sunday. Thankfully both kids still like to cuddle with Mommy. We’re cheating on our hippie store. We’ve been shopping at a different hippie store, because they offer better deals. Hey, in this economy, you gotta do what you gotta do to save money. We celebrated our 12th anniversary on Sunday by making pot roast. It’s was yummy, and my first time making it. Geoff also played his violin in church that morning, but I missed it because the kids were still coughing that wet sounding cough. Not much else is going on. We did book our campsite for June, and I’m super stoked that Chad, Khara, & Kona (their dog) are joining us. We’re in the same spot as lsat year, and they’ve reserved the site next to us. Since the kids were sick all last week, we watched a lot of movies. We watched Wall-E 3 times. So I’ll close with a quote from that. Captain: Oh, I see the ship’s log is showing that today is the 700th anniversary of our five year cruise. Well, I’m sure our forefathers would be proud to know that 700 years later we’d be… doing the exact same thing they were doing. I don’t really know how I’m supposed to transition from such a serious post, to the normal stuff I post about. I’m just not that good at segues. 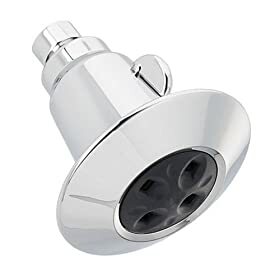 So… in my small quest to be a little greener, I bought a new showerhead. It’s very nice. Feels great, and evidently uses less water. Which is awesome. I’m willing to do things to lessen my footprint and be green, but sacrificing long hot showers…not gonna happen! Now I can feel better about taking them. I’m all over taking baby green steps that don’t break my bank. I’m having an emotional day, and I’m not ready to blog about all of it. I’m still crying over my own stuff. Shocking I know, the robot does cry once in a while. Add to that, my eyes and nose have been running, and I look awful! Just pray for me to get a little perspective, and an understanding heart.